We generally sweat when we do some sort of exercises like running or workout. The unwanted substances came out from our skin that feels really sticky and uncomfortable. We know that’s exactly a sweat. Sweat gets a bad rap. We blame it for stink. We accuse it of staining clothes and ruining white tees, and we react in disgust when it appears. But this ill will toward perspiration is misguided. How does this substance suddenly materialize and what exactly is its purpose and Why do we sweat? And we don’t just sweat when we’re hot. It’s also normal for people to sweat when they’re nervous because emotions can affect the sweat glands. But there is some scenario that can make us sweat: eating spicy foods and when we’re sick. But exercise is probably the most familiar and common. In the case of exercise, sweating happens as a response to movement triggered deep inside your cells. As you increase your pace, your muscles work harder, increasing their demand for energy. A process called cellular respiration consumes glucose and oxygen to form ATP (adenosine triphosphate), the energy currency of the cell. Much of this process takes place in structures called mitochondria. The more you move, the harder mitochondria work to supply your body with energy. All this work comes at a cost, though. As the cells break down the ATP (adenosine triphosphate), they release heat. These are distributed all over the body with especially high concentrations on the palms of your hands, the soles of your feet, and on your head. When a sweat gland first receives the signal, the fluid surrounding the cells in its coiled base contains high amounts of sodium and chloride. The cells pump these ions into a hollow tube that runs through the sweat gland. Then, because it’s saltier inside the tube than outside, water moves into the tube by osmosis. As what’s called the primary secretion builds up in the bottom of the tube, water pressure pushes it up into the long straight part of the duct. Before it seeps into the skin, cells lining the tube will reclaim as much salt as possible. So the process can continue. The water in sweat absorbs your body’s heat energy and then evaporates off of you when it reaches the surface, which in turn lowers your temperature. This process, known as evaporative cooling, was an important adaptation for our ancestors. This cooling effect isn’t only helpful during exercise. We sweat in many other scenarios, too. 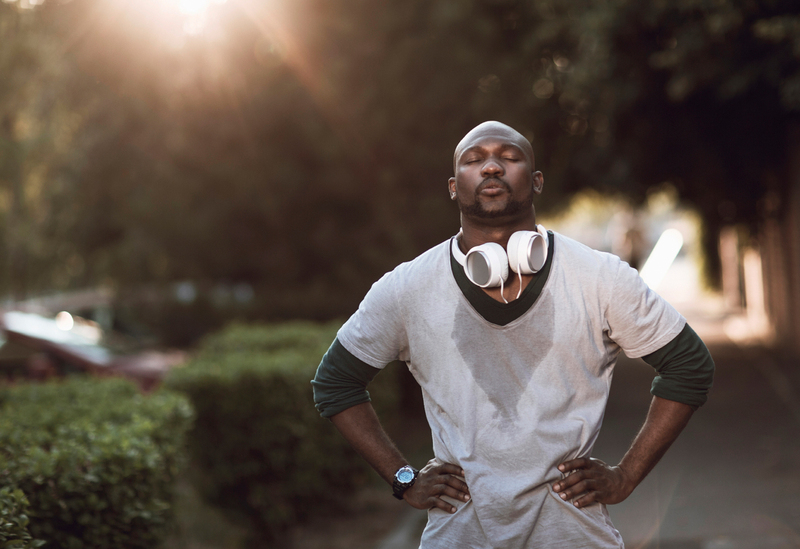 Sweating is also part of the fight or flight response stimulated by stressful scenarios, like asking someone on a date or interviewing for a job. This happens because adrenaline stimulates muscle activity and causes blood vessels to widen two responses that increase heat and trigger the sweating response. And sweating also occurs when we get sick. When we’re feverish, we sweat because infections stimulate the hypothalamus to increase muscle activity, which in turn releases more energy as heat. That increases your overall temperature, a protective mechanism that makes your body less habitable for infectious agents. Like with running, sweating helps your body vent that heat. When the fever’s over or you’ve won your race, your temperature receptors sense the decrease in heat and the hypothalamus brings your sweating response to an end. In some cases, like after a run, the hypothalamus also signals to your body that you need to replenish the water that you’ve oozed out. The article is gleaned originally from TEDEd- Why do we sweat? but with added more information. If you’re interested, you can watch the video below. Read More: What causes body odor?